Donating to charity? Here’s another thought! Did you know that in 2018, corporations are estimated to give more than $17 billion to non-profits? Have you written a check for your portion of that? Hold the door. Put the checkbook away. There is a better way to give back and it will likely cost you a LOT less. Sponsorships. Every community has events going on. 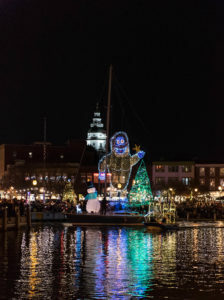 Festivals…carnivals…little leagues…dance troupes…theatrical productions…parades….and here in my waterfront town we just has a lighted boat parade this weekend! While it is an easy and good way to become a vital member of your community, remember that this is a two way street. It is NOT all get without some give! Remember, your business stands to gain just as much from sponsoring an event as the event stands to gain from having you as a sponsor. A smart business understands that community-wide success means growth for everyone and investing in the community is, by extension, investing in their own success. A rising tide lifts all boats. Here in Annapolis we play host to the Military Bowl. The Corporate sponsor is Northrup Grumman—a giant aerospace company with a large presence in the area and an even larger one in the military. I have no idea what the cost of something like that is, but their name on the field for the ESPN televised game, 44,000 tickets, and all of the online and hard copy promotion is huge. Certainly the sponsorship pales in comparison to the cost of obtaining all that reach. OK let’s be real—we don’t have Northrop Grumman money. But, most nonprofits are very open to corporate sponsorship and aren’t necessarily picky about its sources. And most importantly they tend to not be too rigid on the requirements. For example, if you have a large social media following, by using your audience, the non-profit can reduce their cost of reaching the same audience. If you are cash short (aren’t we all?) but maybe have a supplier that will co-op a trip for you, there is huge benefit to a non-profit that can give away a trip to Ireland as the grand prize. You get the idea. Think of impressions rather than dollars. Generally, the dollars will come to the non-profit via other sponsors (with deeper pockets) and from the event itself. Businesses can make their marketing dollars really stretch via corporate sponsorship. I know of one agency that allocates nearly 100% of their marketing dollars to sponsorships in the local community. Sponsorships promote recognition, publicity, and community support. Disclaimer: It is a retail location in a small mid-western town that does not rely heavily on the Internet. People like doing business with people like themselves. And when an individual and a corporation are both supporting a common event, there is a connection and a synergy. Sponsoring events is one of the most effective marketing channels; yet one of the most overlooked. Stand out as a business that supports community development and charitable work through action rather than words—or simply donated dollars. It works. Don’t believe me? TRO has seen considerable growth over the years by sponsoring various travel shows. Give it some thought! A New Year is coming, time to clean up house! OK, I am not sure of the origin of the axiom “penny wise and pound-foolish” but lets suffice to say it is British and I am too lazy to head to Wikipedia and look it up. But, the phrase is an important one that is all too apropos in the travel industry.